Robert and Bulat, the creators of «Vagabond Hostel», spent traveling around the world with theirs backpacks. Saw new countries, met different people, same travelers and vagabonds as they are. 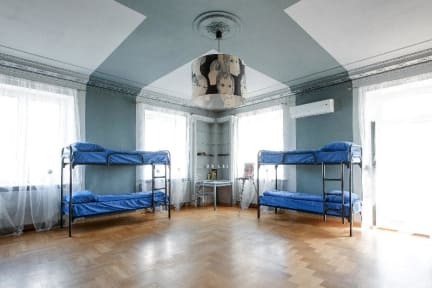 In any country and in any city they always chose the hostel for a rest. Returning back to Moscow, using their own travel experience, Robert and Bulat created hostel for true travelers and vagabonds. Moscow windows and French balconies of all rooms of the hostel are located on Tverskaya - the central street of a capital. People are hurried, taxis are honking and very close are visible Kremlin Stars. Our hostel could provide you with VISA SUPPORT and OFFICIAL Visa REGISTRATION TRANSFER to/from the airports or TAXI to all the railway stations. To make your trip in Moscow much easier, we provide a TICKET SERVICE, free maps and special transport CARDS. 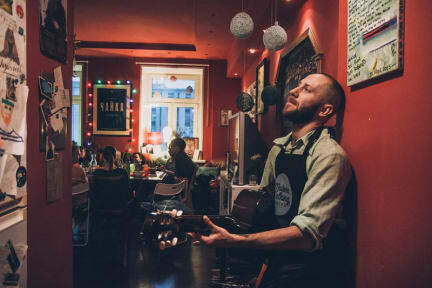 Such exciting activities as FREE WALKING TOURS, PUB-CRAWLING, FOOD TOURS and tickets to the BOLSHOI THEATER are also available at Vagabond Hostel! Breakfast, lockers, cloth/hair dryer, towels seat clothes, coffee/tea/snacks and the best VIEW from the balcony are included into the price! What is more, your LUGGAGE could be kept in our Hostel even after your check-out.